Looking to combat hard water? Tired of impossible to remove spots on your dishes and dull skin after showering? Contact your Annapolis water softener installation experts at (410) 268-7191 to reduce the effects of hard water. Take advantage of our current online specials here. Heidler, Inc. is here to help improve the efficiency of your everyday tasks and chores that involve washing or cleaning. We are your Annapolis water softener installation and repair team. Whether you need help choosing the right system for your home or you need to fix a faulty system, we have the solution for you. Click here to see how we have helped your neighbors solve their plumbing problems. 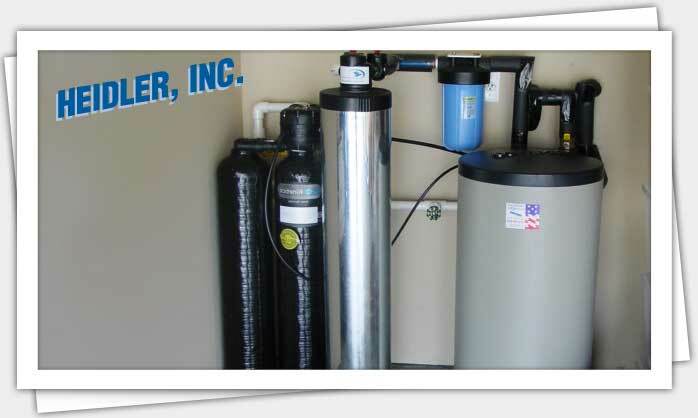 Water softening systems offer improved water quality by eliminating calcium and magnesium from your hard water supply. Untreated hard water can leave a filmy residue on dishes, reduce water flow from faucets and fixtures, and even make bathing or showering a less enjoyable experience. With a water softener, you don’t have to dread cooking, washing, doing the laundry, or even showering. Professionally installed water softeners can benefit your plumbing fixtures, your clothes, and even your skin and hair. Water softeners reduce the effects of harsh minerals found in hard water. Treated water will feel softer on the skin and can be used in a variety of cleaning efforts to greater effect. By treating and removing elements that would have otherwise built up to form mineral deposits in your pipes and fixtures, water softeners help extend the life of your fixtures, appliances, and overall plumbing system. How often is maintenance required? The water softening process is a multi-stop approach. Filtration systems that are not properly maintained or utilized are less effective at removing sediment and minerals from your water supply. Water softenrs feature a brine tank that is filled with resin beads coated in sodium to treat hard water. Refilling the tank with salt and ensuring that its settings are properly adjusted for the volume of water and level of heavy elements being treated is essential. How often you refill the tank with salt depends on how often your system regenerates. On average, homeowners refill their tanks every eight weeks. If you notice that the water level is higher than the salt, it is time for a refill. Why should you trust your water quality needs to us? Heidler, Inc. will help you choose quality products and carry out solutions that provide guaranteed results. Our experienced technicians will assist you in selecting the ideal water softener system that fits your needs and budget. You can count on us to install it for you without hassle, so you can start enjoying improved water quality as soon as possible. Dread washing the dishes or doing the laundry because you know everything will come out looking dull? Tired of dry skin or brittle hair from hard water showers? Don’t let hard water keep you from maximizing the efficiency of your everyday tasks. Call us today at (410) 268-7191 to learn more about your water softener options.